This fully modernized version of the beloved Piston Honda design presents a fully-featured wavetable oscillator with all of the character and none of the compromises. 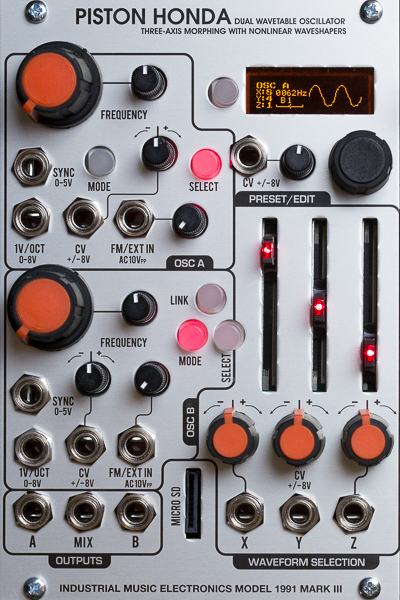 Each of the two onboard oscillators can select from the internal bank of 512 waveforms, arranged as an 8x8x8 cube with full CV control over each axis. 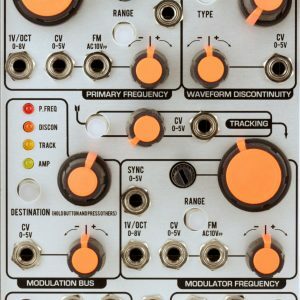 The factory waveform set includes a diverse collection of smooth, noisy, harmonic, and intense sounds, provided by Industrial Music Electronics and several tried and proven modular synthesizer artists. Whether you are recalling the sounds of yesteryear or soundtracking the future, there’s something in the wave set for you. Conveniently upload your own custom waveforms into the Piston Honda using WAVE files on a Micro SD card. No more hex editing, USB programmer, or expander board. Each oscillator has full frequency controls, a thru-zero FM input, and a dedicated unison detune oscillator for a total of 4. 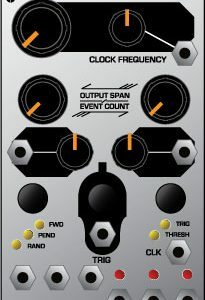 The single set of wavetable controls can be quickly activated for each oscillator, to set different waveforms on each without interrupting the moment. The graphic display eliminates any ambiguity in waveform selection. Enable the external input mode to drive an external signal to be shaped through the selected wavetable, with voltage-controlled gain. The CV inputs give instant access to the various parameters of the Piston Honda, faster than your hands can move the controls. They accept positive or negative voltages, all the way up to 10 volts with a sampling rate high enough for meaningful audio-rate modulation. The response of each input has been carefully tweaked for the best action with common CV sources. 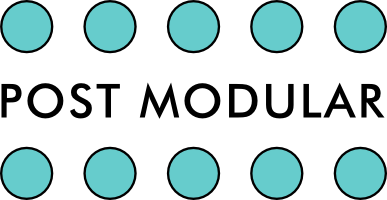 They retain enough resolution and range for effective response to the full range of voltages that your modular can produce. 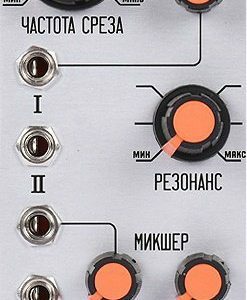 The Industrial Music Electronics Mark III platform brings the latest digital conveniences to modular synthesizer technique, expediting the patching and performance process while introducing the most powerful storage and recall facilities to extend the modular method to new frontiers. A graphic display immediately shows the current waveform, its frequency, note number, and a small tuning indicator. It also provides access to a simple menu to set deeper parameters and manage the memory. The preset manager can control every knob or slider on the panel from a single control voltage, storing 8 slots of data. It can also ignore the frequency settings when changing presets, becoming an advanced multistage, multidimensonal timbral modulator. Switch the preset manager into Morph mode and you can smoothly transition between entire presets as if they were just another wavetable. 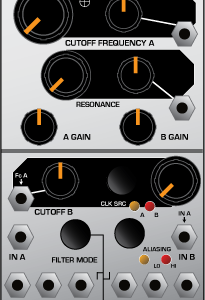 A random preset generator is available on menu demand or in response to trigger input. Micro SD card slot for loading user waveforms. CV inputs accept +/- 10V. Colorblind-friendly interface. No color codes.